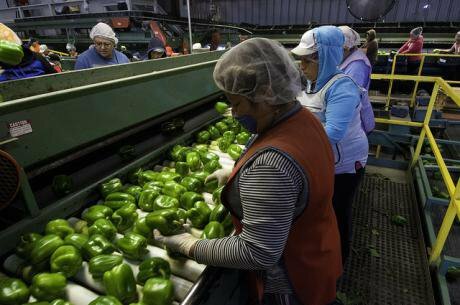 Migrant workers process green peppers in California. Bob Nichols for USDA/Flickr. Creative Commons. The plight of migrants crossing the Mediterranean to seek entry to the European Union raises profound issues for Western democracies and their responsibilities for those beyond their contemporary borders. The current response of governments is that maintenance of a ‘European model’ of welfare requires strictly policed borders and populations, as well as military action against the ‘business model’ of those they are pleased to call ‘traffickers’. We suggest a different way of defending welfare regimes and addressing the legitimate claims of the world’s poor through an alternative global social democracy based upon reparations and a collective concept of freedom. The current official EU response invokes the language of ‘anti-slavery’, but directs it against migrants fleeing poverty and civil disruption caused by war and other acts of oppression. However, a new ‘economic’ argument has entered the debate. Recently put forward by Chicago University law professor Eric Posner and economist Glen Weyl, and pitched to the World Bank, this is a ‘pro-slavery’ argument for the free movement of unfree labour. An echo of their argument is heard in the suggestion by Italian interior minister, Algelino Alfano, that migrants should be made to work for free. Posner and Weyl argue that attempts to address inequality within nation-states do nothing to alleviate global inequality. This is because of a perceived need for closed borders, which are assumed to shield domestic labour markets and welfare budgets from the competition and claims of the migrant poor (notwithstanding that migrant consumption of welfare benefits is greatly overstated). Yet, they argue, it is precisely the movement of poor people from the global South to the North, together with the sending of remittances back to the global South, that will do most to reduce global inequality (even if inequality rises within the national welfare states of the global North). They are conscious that ‘open borders’ would need to be sold to populations and politicians in the global North. Their solution—and this is no Jonathan Swift-style satire—is a rigorous ‘othering’ of migrants, to create what they explicitly describe as a caste system. Their model is Qatar where migration by co-religionists of the majority population is discouraged in order to reduce the development of solidarities between local populations and migrant workers. ‘Belonging’ is a privilege of local citizens; migrants are displaced from where they belong and are to be offered no recognition in the places to which they move. At the same time, Posner and Weyl suggest that migrants should be paid significantly lower wages than those typical of even low-paid workers in the host society. They must also be deprived of rights to organise and protest, and are to be delivered into a strict subordination to employers as indentured labour. While the exploitation of indentured labour will be to the benefit of employers (and some consumers) in the North, they claim that it will also be to the betterment of indentured labourers themselves, who are escaping the worse conditions they otherwise face ‘at home’. The idea of the ‘betterment’ of indentured labourers and those they have left behind, however, depends on the idea that the global North bears no responsibility for the conditions found in the global South. It furthermore relies on the notion that, however constrained, indentured labour represents a ‘choice’. At what point does ‘indentured labour’ become so constrained that it represents enslavement? In a separate piece, Weyl argues that the forced transport of enslaved Africans to the US brought about an improvement in the circumstances of African Americans, when compared to those that remained in Africa. At the same time, he describes systematic racism as the way in which this beneficial outcome was achieved. However distasteful, this is a simple utilitarian argument for the efficiency of free trade. What should be clear, however, is that for Posner and Weyl, freedom of trade is on only one side of the capital/labour relation. Global capital is allowed unregulated free movement, while free movement of labour is to be severely regulated. Domestic capital should be free to exploit indentured labour, while migrant labour should be policed and prevented from claiming rights enjoyed by other citizens (though it is unlikely that local populations in the global North could be insulated from the effects of divided citizenship and merely enjoy the fruits of the indentured labour in the form of cheap services). Like other advocates of free markets, they are doubtful that alternative models of alleviating poverty, such as foreign aid, can ever overcome the corruption of governments (though they endorse private philanthropy). What they ignore, however, is that corruption is very much a product of the free movement of capital that they endorse. ‘Payoffs’ to local elites for access to land, minerals, and fuels are, almost always, cheaper than properly compensating those dispossessed by that access. If there is any ‘business model’ that public policy should disrupt, it is this one. Posner and Weyl furthermore fail to address the fact that while efficiency gains accrue to a tiny minority of the world’s population, all ‘rational’ individuals are enjoined to accept their necessity. They thus argue strongly for market freedom of individuals based on private property, yet do not interrogate how asymmetrical possession of private property itself derives from systematic dispossession. In other words, they do not (or choose not to) see how the accumulation of private property is based on land grabs, enclosures, displacement of local systems of subsistence, and access to mineral extraction through corrupt contracts with local elites. It is dispossession that produces the conditions of impoverishment that make indentured labour a ‘choice’ preferable to starvation. Why should public policy support the individual rights of the few over the collective rights of the many? Why should individual rights provide returns to owners of private property while no compensation is offered for the concomitant loss of collective rights? Back in the eighteenth century, Thomas Paine wrote in Agrarian Justice of the need to provide reparation for the loss of concrete and specific rights by agricultural workers following the enclosure movement that drove them off the land (in turn, for some to migrate to settle supposedly ‘virgin’ lands and dispossess indigenous populations elsewhere). Paine’s argument remains urgent in the present as an argument for global social justice. It is one that is potentially transformative in the current debate about migration. Current EU policy towards migration seeks to establish a hostile environment to discourage migration, while the free market option is based on unfree labour. Yet it is possible to envision a different way forward that addresses the conditions from which migrants seek respite. This would involve transfers from the global North to the global South, but they are not well-described as foreign aid. In contrast, they should be described as reparations that compensate for past dispossession (through colonial appropriation and enslavement) and that ensure compensation and proper participation in decisions about current appropriation. A new initiative that is arguing for global social justice on this basis is the Caribbean reparations movement. The Caribbean Community and Common Market (CARICOM) has established a reparations commission to design a development agenda for the region based on the redress of historical wrongs associated with colonialism, enslavement, and dispossession. The arguments for reparatory justice are codified in a 10-point plan that includes the address of the public health crisis and combatting illiteracy. Reparations are to enable a social democratic solution to the problems continuing from the legacies of colonialism, enslavement, and dispossession. Once aid is re-described as reparation, it is evident that the UN Millennium goal of rich countries contributing 0.7 percent of their GDP—a goal that few meet—is scandalously low in relation to the benefits they derive from the past appropriation of resources from other countries. The problem is not that social rights (embedded in the welfare states of the global North) are an obstacle to market solutions to global inequality, but that the market itself is an obstacle to the internationalisation of social rights and democratic accountability. Now that the language of anti-slavery is used to target the trafficking of migrants, it is time that the plight of migrants themselves, and their rights, become the focus of political attention. We are at a moment when a new slavery is being argued under the guise of a liberal realism. We should be aware that its realism derives from the defence of privilege and not from concern for the global poor. Note: As well as the op-ed piece with Posner, Weyl has written ‘The Openness-Equality Trade-Off in Global Redistribution’, a lengthy paper on the topic. The argument endorsing slavery is made on page 29 and illustrated through the case of slavery in the US on page 32.